More than 30 authors are featured in this year’s Cherie Smith JCCGV Book Festival, from the time it opens on Saturday night, Nov. 22, with Israeli author Zeruya Shalev (The Remains of Love) till it closes on Thursday night, Nov. 27, with Toronto emergency physician and CBC Radio host Dr. Brian Goldman (The Secret Language of Doctors). Here’s a taste of what to expect each literary day. 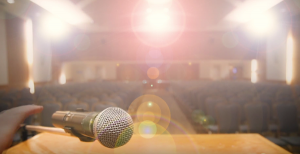 Speaking twice on Sunday is writer, editor and activist Nora Gold. Her late-afternoon talk will be about jewishfiction.net, an online journal that she founded and edits. 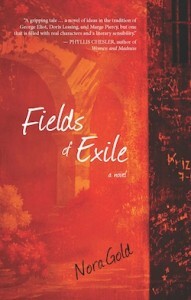 In the evening, her novel Fields of Exile will be the focus. In it, the main character, Judith, faces antisemitism in the guise of anti-Israelism on the fictional campus of Dunhill University, where she is taking a master’s in social work. Gold’s opinion on the subject comes out clearly and the novel will make many Jews who have had to endure Apartheid Weeks and anti-Israel propaganda on campus feel less alone; the frustration and fear that Judith experiences will be familiar. Judith is a knowledgeable and critical supporter of Israel, she has lived in the country, worked for peace and on human rights projects there, and only returns to Canada because her father becomes ill. Nevertheless, with few exceptions, her opinions on Israel are discounted and dismissed by professors and students alike. Ultimately, the anti-Israel words and images turn into violence because they are never put in check by the university, each professor having their own reasons for ignoring, or not speaking out, against antisemitism. Joseph Kertes shares his session with Ayelet Waldman (Love and Treasure), hosted by Janos Maté. Kertes’ The Afterlife of Stars follows the Beck family’s flight from Budapest to Paris as Russia invades Hungary in 1956. The terrifying reality of the period, the human and material losses, are tempered by the story being told by 9.8-year-old Robert Beck, whose class is in the process of reviewing decimal points when the book begins. Robert and his 13.7-year-old brother Atilla don’t necessarily understand what is happening, though Atilla is wise beyond his years, always asking questions, philosophizing, taking Robert on dangerous (though they don’t usually realize it) journeys, to see a movie, to see some statues, various adventures without their parents’ knowledge. The wonder of the brothers and their relationship provides the energy of the story, which slows and becomes pedantic in places where historical or background information is explained, especially once the family reaches Paris. 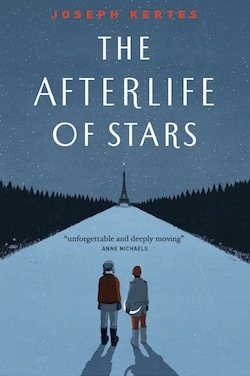 Overall, though, The Afterlife of Stars is mostly a charming tale with moments of sadness and beauty, written from a unique perspective. 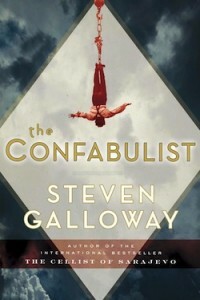 Steven Galloway’s most recent novel, The Confabulist, is, in a word: fun. This tale of Houdini, as told by Houdini and Martin Strauss, the man who killed him (twice), is perfect vacation/relaxation fare. Galloway explains some of Houdini’s greatest illusions, regales with tales of Houdini working with the secret service as a spy and captivates with Houdini’s efforts to expose spiritualists for the frauds they were perpetrating – on some very powerful and influential people. Out of all the threats facing Houdini, it was an unexpected punch in a bar that killed him … or was it? The entertainment value of The Confabulist is enriched with ponderings on the role and purpose of magic in our lives; the fallibility and malleability of memory. Both Houdini and Strauss contemplate how they have lived and what they have accomplished, and perhaps their observations will prompt readers to think about their own pleasures and regrets. Or maybe they’ll just enjoy the show. Susan Wener has had several serious health issues in her life, including two bouts of cancer. 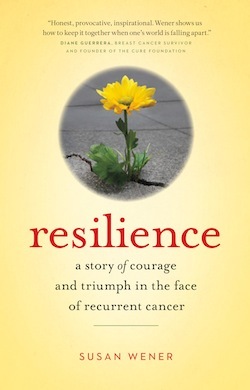 In Resilience: A Story of Courage and Triumph in the Face of Recurrent Cancer, she matter-of-factly takes readers through her experiences and how she handled them. Already a health-care system veteran when she was first diagnosed with cancer at age 36, when her children were young, Wener hoped to live long enough to see them to adulthood – she now has several grandchildren. There are many life lessons from such a memoir, of course. One of the most powerful in this one is that it’s OK to be angry, to breakdown, to react how you react. You are not in charge of the disease but you are in charge of everything else, what tests and treatments you undergo, what therapies you try, who you ask for help, how you live your life. Wener writes without bravado. She kept getting up every day, but she wasn’t always a fighter or optimistic. Her illnesses, especially the last serious one – years of pain and horrible treatments before being diagnosed with a functional obstruction in the colon – pushed her to the limit, as the title of that chapter openly admits. But she did push through, she took the tests, did the research, underwent the surgeries, made the decisions. Wener shares her thoughts about and discussions with her husband and daughters, and these moments are incredibly emotional. Readers will readily imagine such conversations with their own family and friends and, despite the lack of sentimentality with which Wener writes – or perhaps because of it – most readers will not be able to get through this memoir without getting a little choked up and teary-eyed at times. 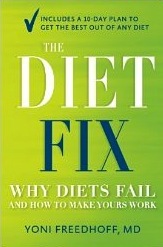 In the penultimate event of the festival, Dr. Yoni Freedhoff speaks about The Diet Fix: Why Diets Fail and How to Make Yours Work, a clear, concise book that outlines the main weaknesses and myths surrounding dieting, and offers a detailed program that Freedhoff believes can result in success – i.e. long-term weight loss. It is not a difficult program, but neither is it for the faint of heart. Be prepared to diarize, measure, goal-set and cook. And to be patient, both with the length of time it might take to lose the weight but also with yourself if you break your diet or exercise routine. The book ends with recipes for snacks and meals, as well as suggested reading and other resources, including smartphone apps.